Up the trail, Julian’s parents joined other adults for a three-hour liturgy near the Orthodox church that enshrines the tomb of St. Herman of Alaska. But here in the forest, beside a small wooden shelter of candles and icons, the children were partaking in another Orthodox tradition. The spring water that Julian was drinking is considered holy. According to local tradition, the spring was discovered by the monk Herman, a starets (or spiritual father in Russian), who came to Alaska from Russia in 1794. Until his discovery of the spring, the island was thought to be without fresh water. Pilgrims credit the spring water with healing a number of medical and spiritual ills. Each summer, the Orthodox Church in America’s Diocese of Alaska organizes a pilgrimage to Spruce Island, an hour’s boat ride from the fishing town of Kodiak. Most come from the Alaska Native villages in the Kodiak region, but some come from as far away as Eastern Europe. St. Herman was not the first Russian to come to Alaska. Legend holds that Russian settlers first established a colony in 1648. And in the early 18th century, Russian explorers and merchants sailed to Alaska by way of a strait (later named for one such explorer, Vitus Bering, who was in fact a Dane in the employ of Peter the Great) separating Asia from North America. They returned with sea otter pelts, which proved very valuable. 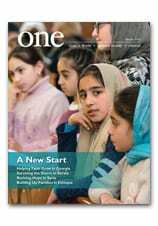 Read more about Orthodox Alaska in the November 2006 issue of ONE. And you can learn more about the Orthodox Church of America in a profile from 2012.